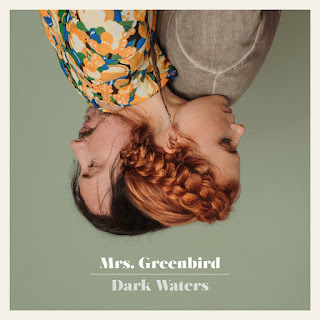 On paper, Mrs. Greenbird would have been a difficult sell for me: male-female duet, emphasis on the"pop" part of folk pop, a Gothic tinge, big arrangements. Usually that's an instant "no" for me but there's a reason Mrs. Greenbird won the third season of Germany's X-Factor: they can really sell what they're singing. That makes a certain amount of sense, before they formed Mrs. Greenbird, Sarah Nücken and Steffen Brückner worked among church groups and choirs in Cologne, Germany. It's that sense of joyfulness and awe often found in religious singing that comes through in Dark Waters -- the sense that the duo's life is hanging in the balance of each note. The album's title track, "Dark Waters," brings all of Mrs. Greenbird's major sonic elements together in a swirling crescendo. (You'll hear it on tomorrow's Adobe & Teardrops podcast on Friday -- but you can contribute to our Patreon if you don't want to wait!) Even in the midst of the narrator's despair, though, we feel uplifted -- we know that, somehow, the dark waters won't overtake us. Dark Waters arrives at an interesting moment, one where the perpetual debate over what is country music and who gets to make its particularly fraught. Mrs. Greenbird proves, though, that if you have strong songwriting and the truest measure of authenticity -- believing in your music, no matter what it sounds like, you're as country as it gets.